Ever since I was little, I’ve had this fascination with history and when it came to warfare I almost exclusively honed in on World War II. As I grew older I was able to understand everything about what I was seeing, what I had been partaking in with my favorite video games like Medal of Honor and Call of Duty: Finest Hour. And even moving away from video games, I loved movies like Saving Private Ryan and Band of Brothers. Seventy plus years on it’s almost hard to imagine that such an event occurred... but it did and it needs to be remembered, even in the most gruesome of details. It’s been nine years since the last wave of big World War II games. You had Medal of Honor: Airborne in 2007 and Medal of Honor Heroes 2 in 2008, which ended the World War II-era for that particular series. In 2008, Call of Duty returned for one last World War II sized hurrah with World at War, and that game went up against Brothers in Arms: Hell’s Highway, the most recent entry in Gearbox’s WWII series that hasn’t seen the promised sequel since then because Gearbox is too busy drinking that Borderlands kool-aid. They say they’re working on it, but until I see an actual trailer for it I’ll consider it vaporware. I digress though, since then the only World War II games we’ve gotten have either been of the indie variety or of the RTS genre. There was Enemy Front in I believe 2013, but that game fell so flat that barely anyone remembers it even existed. I only know about it because I read about it. And Wolfenstein doesn’t count because it’s a sci-fi series that takes place in an alternate history. And now we’re getting the first real World War II shooter in a long time and after watching the reveal trailer for it, I’m as hyped as I can be. I don’t care what the multiplayer is like, I just want to experience this story that is not sparing any expense when it comes to the authenticity of its setting, that includes the racism and sexism of the time and the brutality of the war itself. A World War II game without dismemberment, without massive amounts of character deaths, both named and unnamed, without soldiers mentally breaking down, just wouldn’t feel like World War II to me. If there is one thing that I’m not too happy about, it’s that the singleplayer campaign focuses exclusively on the Americans, and that is coming from an American. There were many nations that fought in the war and have their own stories to tell. However, having said that, there is merit to telling a long, focused story about a select group of people, rather than a series of anthology stories like what Battlefield 1 and previous WWII Call of Duty games did. Neither is bad, they just have different strengths and weaknesses. Spread the story out across multiple, smaller stories, and you risk the player not caring about any of the characters or anything that happens, but you let the player see different sides of the war. On the other side of the fence, a more focused story gives the player time to bond with the characters and witness how one event led to another, but at the expense of other viewpoints and major battles of the war that one particular faction may not have been involved in. 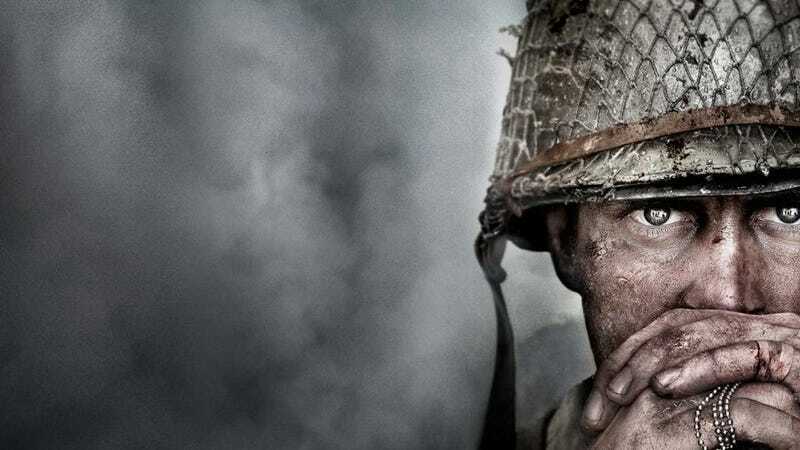 For example, Call of Duty: WWII’s singleplayer campaign focuses on the European theatre, but that wasn’t the only theatre of war the American troops specifically were involved in. There was also the Pacific theatre, which is potentially absent from Call of Duty: WWII due to its European focus. It was shown in Medal of Honor: Rising Sun and Call of Duty: World at War, but other than that, not much exposure. I say it’s potentially absent because Call of Duty: WWII supposedly has a co-op campaign that is entirely separate from the singleplayer campaign. How it’s structured I have no idea. This could be where the battles of other nations exist, or the other theatres. I’d love a German campaign, but I know I’ll never get that and have accepted that fact. Besides, I’m sure the next Battlefield game, provided it’s set in World War II, will scratch that multi-nation itch. All in all, I like what they’re doing with this game. The atmosphere and imagery looks to be exactly what I expect from a World War II game, and the story itself seems to be taking cues from Band of Brothers and there is no better source material in my opinion for telling a great World War II story.